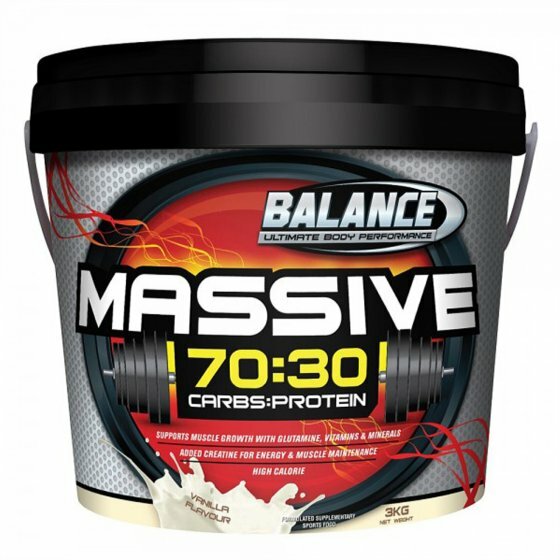 The Balance Massive 70:30 is the ultimate protein source to meet the high energy demands of training, ideal for 'hard gainers' who have difficulty gaining weight or maintaining muscle. This formula contains added glutamine, creatine and branched chain amino acids (BCAAs) for energy and muscle maintenance. Added carbohydrates deliver high energy to support fast recovery and support weight gain. Directions: Shake or blend 80g (2 raised scoops) in 400ml water or milk. Up to three serves per day. Recommended Use: Use between meals to support metabolism or as recovery formula 60-90 minutes before training and within 30 minutes after exercise. Ingredients: Carbohydrate Blend (Maltodextrin, Glucose Syrup Solids), Protein Blend (Whey Protein Concentrate, Skim Milk Powder, Sodium Caseinate), Cocoa, Vegetable Fat, Flavours, Creatine, Vegetable Gums (Xanthan, Guar), Glutamine, Emulsifiers (Sunflower Lecithin, 471, 472c), Anticaking Agent (Silicon Dioxide), Sweetener (Sucralose), Vitamins and Minerals (Ascorbic Acid, Vitamin E Acetate, Ferrous Fumarate, Nicotinamide, Zinc Oxide, Manganese Sulfate, Pyridoxine Hydrochloride, vitamin b12, Calcium-d-pantothenate, Riboflavin, Vitamin A Acetate, Thiamine Hydrochloride, Selenomethionine, Cholecalciferol, Folic Acid, Chromium Nicotinate, Sodium Molybdate, Potassium Iodate, Biotin), Mineral Salts (339, 450), Antioxidant (Mixed Tocopherol Concentrate).